Working with Ipsos Research, we surveyed 3,000 mobile searchers who had recently made purchases across different industries to understand the role that click to call – from paid or organic search results – played in the purchase process. We found that calls are not only an important channel for research and transaction, but also the presence of a phone number in search results can strongly influence the perception of a business’s brand. Click to call is important to consumers across all verticals. Across all seven of the verticals we researched (Travel, Restaurant, Auto, Local Services, Retail, Finance, Technology) click to call was an important feature for people looking to find information and make purchases. 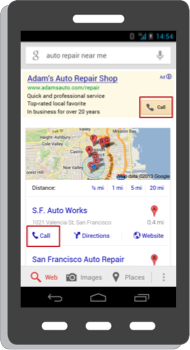 62% of consumers searching for auto parts and services would be very likely to use click to call, and 57% would use click to call to compare pricing. 60% of those searching for car rental information on their phone would use click to call, and 44% would call to make a reservation. Within local services, 76% would use call features to schedule an appointment for professional services. 61% of people searching for financial services on their smartphones are likely to use click to call to make changes to their bank accounts. For most of the past 100 years, if a marketer said he needed a new advertising campaign, everybody knew what that meant. The machine turned on. The marketer called the agency of record’s account team. The account team composed a brief capturing the strategy and called in the wild and wooly creatives to bring it to life. The writers and designers applied their art to one or more of these four finite canvases: the television commercial, full-page print ad, radio ad or billboard. Maybe they would sprinkle in a few coupons. The public played along, too; with no ad blockers or DVRs, they just consumed advertising (or ignored it) en masse. It all just worked. But it doesn’t anymore. Now, there is no machine or even consensus on the basic definition of advertising. And that is the source of both opportunity and crisis. This trailer quickly engages viewers and carries them on a strong emotional journey. The pink biometric trace reflects emotional engagement of the audience as the story unfolds. Forbes’ Jeff Bercovici speaks with Innerscope’s CEO about the effects of viral content on the human body. Neuromarketing practitioners have been criticized for shrouding their work in secrecy and hiding behind client confidentiality while not offering proof of the effectiveness of their science. By tying emotional engagement results to data in the public domain, Marci hopes biometrics and the larger neuroscience field gain more credibility–certainly in the entertainment industry. While Mullen views neuroscience-based methods as an “exciting new frontier for cinema marketing research,” she voices strong caution on the Innerscope study findings. Innerscope Research is a revolutionary media research firm that uses a breakthrough, non-invasive biometric approach to measure and analyze emotional response to all types of media. Founded by Dr.Carl Marci and Brian Levine, Innerscope focuses on emotions, the primary driver in consumer and audience choice. Innerscope utilizes advances in neuroscience, biometrics and proprietary software, combining measures of skin conductivity, heart rate variability, respiratory response, motion and eye tracking to provide deeper insight into consumers’ media and message consumption. This integrated approach measures beyond self report and is unbiased by culture, context and cognition. According to Innerscope’s emotional engagement research, here’s who gets it right (and wrong). Brand Love – The Social Way of Performing Customer Research // Via @socialbakers all credit and thanks!! 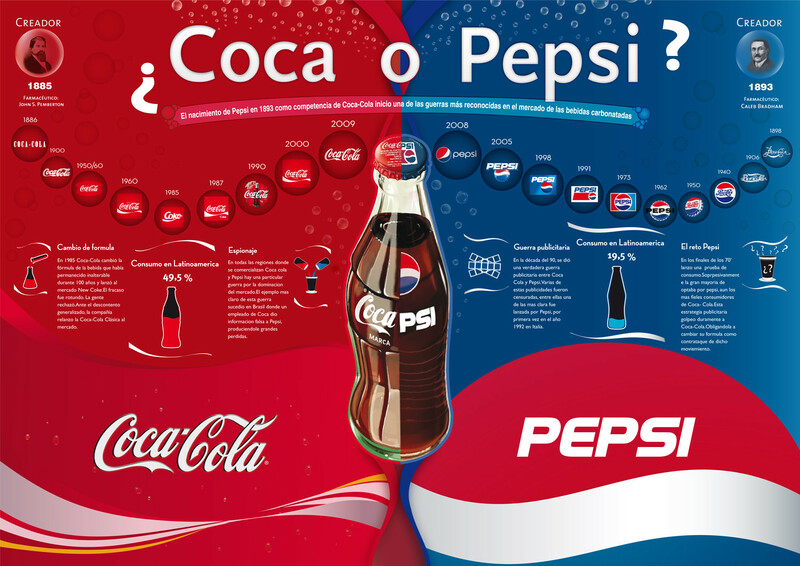 The research also provides us with an industry overview of how consumers feel towards a particular vertical, for e.g. 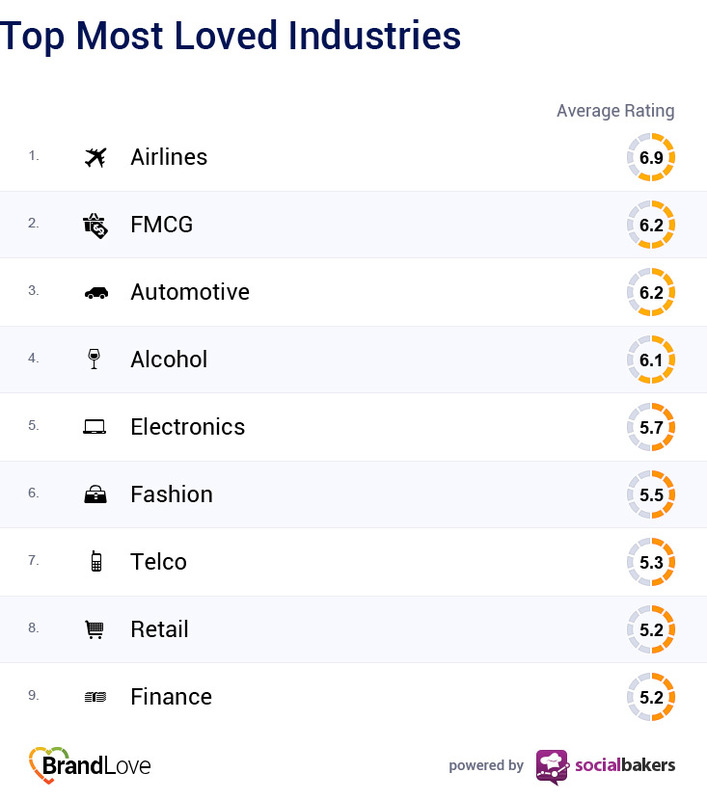 if consumers have a stronger connection with airlines or brands from the FMCG industry. Check out the latest results below! Nielsen’s State of the Media: The Social Media Report 2012 reflects on various social media trends of 2012, as well as the potential impact they will have on the coming year. There is no denying that social media is more popular than ever with consumers, and that having a social media presence is critical for SMBs’ online marketing strategies in 2013. Here are a few highlights from the report. As you might have guessed, the amount of time consumers spent on PCs and Smartphones increased between July 2011 and July 2012. Time spent on these devices grew by 21%, while time on apps rose 120% in that same period. While PCs still remain our primary source of Internet access, the usage of mobile Web and apps are increasing at a significant rate. Small businesses can’t afford to ignore mobile any longer, and should invest in mobile-friendly advertising and sites to reach this growing audience. Time Spent on Social Networks Grew 37%. From July 2011 to July 2012, the time consumers spent on social media sites grew from 88.4B minutes to a whopping 121.1B minutes. 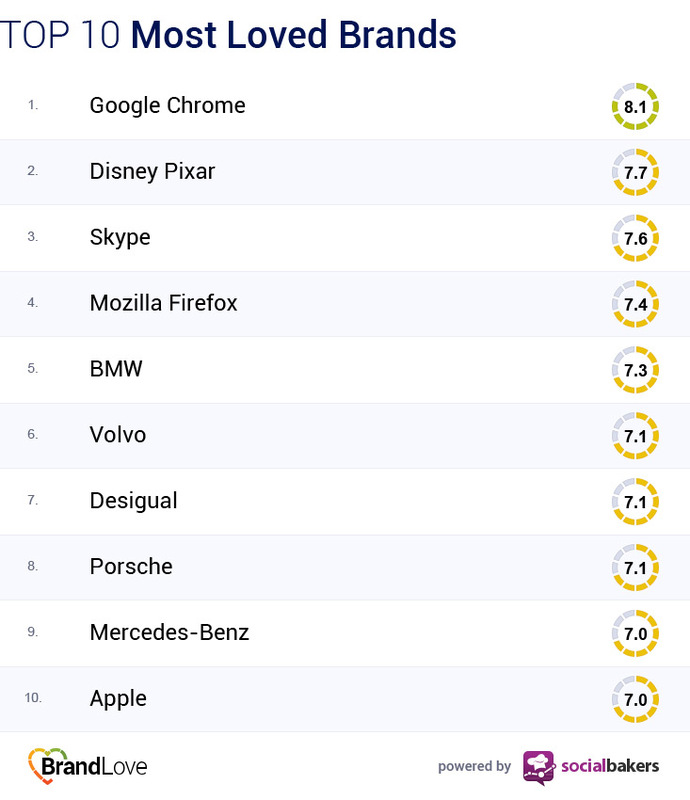 Nielsen attributes this substantial growth in part to the rise of mobile apps, which enable us to stay connected to our favorite sites while on the go. 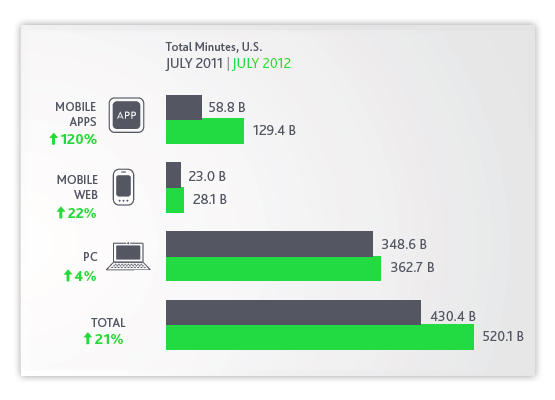 In fact, we spent seven times more minutes on apps than on the mobile Web. Time spent on these sites means social media access is not only on the rise, but also that we are more engaged when we do visit them. For small businesses, this means being active on social media is more important than ever in order to reach consumers spending a large portion of their time there. The Nielsen 2012 State of Social Media report was released earlier last week. I previously went over the report’s findings about the largest social networks of 2012. The report also contains some interesting information about advertising on social media and what it means for consumers. Nielsen found a surprising statistic about consumer sentiment towards social media advertising. Nearly one-third of users believe that ads on social media sites are more annoying than other ads online. Social media isn’t supposed to be annoying. It’s supposed to be meaningful. There are a few things this statistic tells me. Number one is social integration. In an attempt to make advertising more social, many social networking sites “hide” advertising within other content. An example of this is promoted trends on Twitter. These ad units are tied into other trends and tweets on Twitter. To some consumers, this might appear to be deceptive. The result is an annoyance and distrust of the brand advertising, when it should in fact be upon the social network. This number also tells me some businesses aren’t using social media advertising correctly. Many social media platforms offer robust targeting options to their advertising. The goal is to display the right ads to the right people. Many businesses fail at this, and the result is irrelevant and sometimes irritating ads. It becomes frustrating when you see an ad in a language you don’t speak, an area you don’t live in (I’ve had ads for NYC bars in Facebook), and when the ads surely shouldn’t be targeting someone your age. Businesses can avoid this frustration by developing targeting strategies that make sense. Finally, there is the aspect of spam and quality businesses advertising. For example, I have noticed a big drop in quality brands advertising on Facebook. The more lesser quality businesses advertising on a site, the less likely consumers will find these ads trustworthy and relate able. The result is a drop in engagement and an increase in frustration. It’s up to social media sites to develop ways to increase the quality of ads being served on their own sites.